Today you embark on your journey to France! You'll arrive in Paris this morning and be met by your driver at the airport to take you to your hotel. After checking into your hotel, start exploring the City of Love! Your hotel is situated perfectly to be within walking distance of many of the sights, cafes and museums in Paris! This evening, skip the long lines at the Eiffel Tower and head straight up to the first floor, which has been newly spiffed up with a transparent floor and many digital touch screens telling the history of the monument. Collect your priority elevator tickets at the restaurant booth, located on the esplanade under the Eiffel Tower (between the north and east pillars, at least 15 minutes before your reservation). Take your seat inside 58 Tour Eiffel restaurant for your one-of-a-kind dining experience, discovering from the first bite why this acclaimed French restaurant won TripAdvisor’s Certificate of Excellence in 2014 and 2015. Dine on a gourmet 4-course meal with wine as you enjoy a bird’s-eye view of the Champ de Mars, Les Invalides, Montparnasse Tower, Montmartre and the rest of the sparkling City of Lights. After dinner, linger on the first floor to discover some of the new features of the tower (installed on the 125th anniversary of the tower in Fall 2014) or sink in and take in the spectacular view. When the evening comes, choose between sailing down the River Seine while enjoying a 3 course dinner. 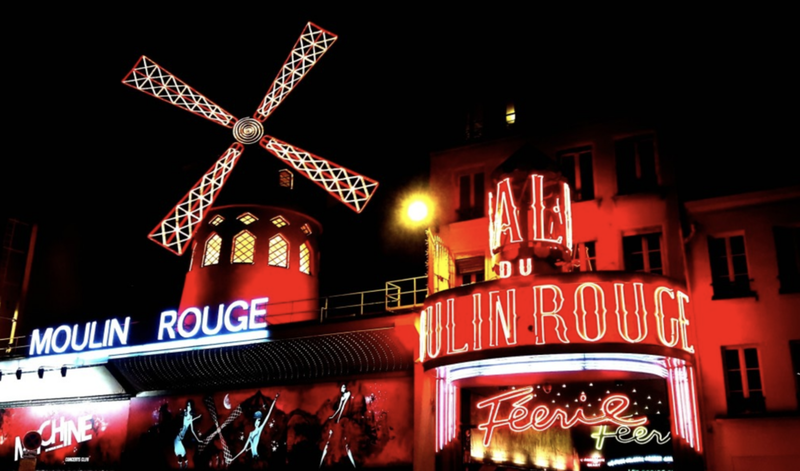 .. OR dinner and a show at the Moulin Rouge! Board a luxury 250-person vessel at your selected time and head out along the sparkling River Seine. Pass the iconic Eiffel Tower, and cruise under Pont Alma and Pont Alexandre III. See the impressive National Assembly building, which houses part of the French parliament, and look out for the Louvre Museum. With an information booklet in hand, you can read up on all the sights from the comfort of your dining table. Opt to head to the upper deck, too, for 360-degree views during your cruise. Dinner and a show at Moulin Rouge! 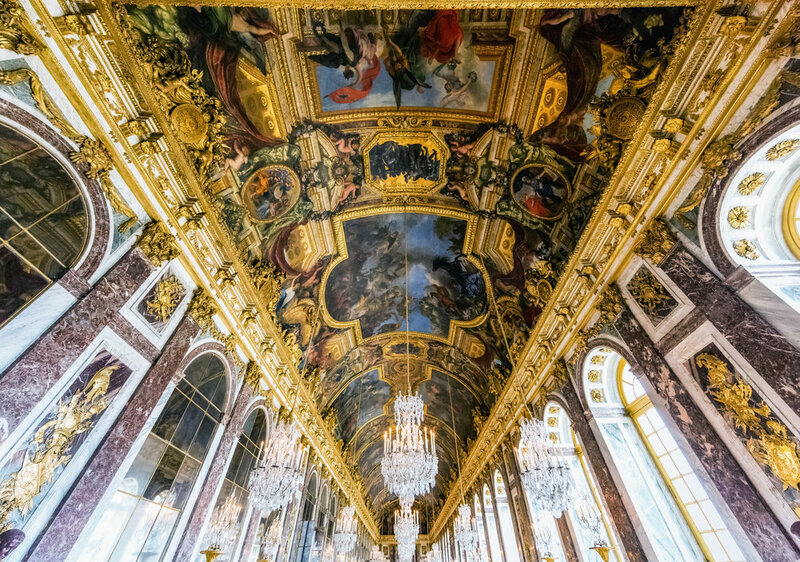 Enjoy an excellent meal in the resplendent Parisian cabaret made famous by the paintings of Toulouse Lautrec. You have a choice from three different menus and a half bottle of Champagne is included. After dinner, see the French Cancan performed in the Parisian home of the Cancan. You'll experience the magic of the Moulin Rouge's "Féerie" review and enjoy the essence of Parisian cabaret. The Moulin Rouge's "Féerie" review features a troupe of 100 artists, including 60 legendary Doriss Girls, dressed in spectacular costumes of feathers, rhinestones and sequins. The sumptuous sets and vibrant light show of "Féerie" provide a colorful backdrop for brilliantly choreographed performances on moving staircases, in a gigantic aquarium, on swings and in garden settings. This morning, you'll check out of your hotel and be taken to the train station by your private driver. Watch the beautiful scenery of the French countryside pass you by on your 1.5 hour, First class train ride to the Loire Valley. Thanks to its emblematic and romantic castles, renowned wine-tasting route, cultural riches and natural wonders, the Loire Valley is one of the most popular– and luxury-drenched– destinations in France. Your driver will pick you up from the train station and be your cheffeur as you discover Amboise and its Market, Château du Clos Lucé, and Château de Chenonceau before deliveing you to your chateau for the evening..
A visit to Amboise starts in the main central square which occupies a large part of the centre of the town, and has the castle to one side and various shops and cafes on the other side. Several of these shops and cafes are established in interesting half-timbered medieval houses and there are also numerous renaissance style houses in the white stone of the region. Before rushing to see the two principal attractions (the chateau and Leonardo's house) allow time to stroll through the historical quarter of Amboise, to the southwest of this central square. One of the principal monuments of interest here is the 15th century clocktower, which is built above one of the original stone gateways originally built as part of the town's defenses. You will also be enjoying the famous Sunday market listed as one of the best of the region. This market takes place in the Place du Marchée beside the Loire river selling wines, cheese, meat, fruit and vegetables of the local area, along with clothes and locally-made pottery. It draws visitors from all over the region and feels more like a fair than a market. Château du Clos Lucé is a relatively small 15th century palace in the Loire town Amboise. It was at the Château du Clos Lucé, on the invitation of King Francis I, that Leonardo da Vinci spent the last three years of his life, devoting his time to perfecting his inventions. King Francis I, passionate by Leonardo da Vinci’s talent, names him “ Premier Painter and Engineer and Architect of the King" and offers him the enjoyment of the Château of Clos Lucé, located only a few meters away from the Château d’Amboise. He frequently met with the young king, who could access Clos Lucé via a 400-m underground passage from the royal Chateau d’Amboise. Clos Lucé, a 15th-century chateau built on 12th-century foundations, now houses a museum dedicated mostly to the life and work of Leonardo da Vinci. To conclude the visit, the large landscaped garden hosts further models, art, and civil engineering works inspired by Leonardo da Vinci. The Chateau du Clos Lucé is one of the most atmospheric da Vinci sites in the world and makes for a truly fascinating visit. In a region renown for its stunning chateaus, Chenonceau Castle stands alone. A masterpiece of Renaissance construction, dating back to the 16th century, the castle was built on the site of an ancient mill on the River Cher. This castle is truly an exceptional site, not only because of its original design, the richness of its collections, its furniture and its decorations, but also because of its destiny, since it was loved, administrated and protected by women, who were all extraordinary and who, for the most part, have marked history. The “Ladies castle” has an amazing museum collection of the Old Master’s paintings: Murillo, Le Tintoret, Nicolas Poussin, Le Corrège, Rubens, Le Primatice, Van Loo… as well as an extremely rare selection of Flanders Tapestries from the 16th century. Throughout its history, this emblematic château has always attracted talent and inspired great artists. Conveying beauty and combining the elegance of architecture with that of the spirit is also sharing an elegant way of life. Your driver will pick you up this morning to chauffeur you to castles and wine estates throughout the Loire Valley. Since more than 25 years, The Champalou Family work for the Vouvray wines. Both from winemaking families, Catherine and Didier Champalou began their Vouvrillonne adventure in 1983, and their desire for autonomy and freedom gave them the will to set up the estate. Everything started with the plantation of one half hectare of Chenin, followed by three years of patience before the vines could produce their first crop. From the first bottling, customers began seeking out the estate. Since 2006, their oldest daughter, Céline, came in Vouvray to continue this beautiful family, human and wine making adventure. They currently work in accordance with sustainable farming methods. Today their production amounts to approximately 120,000 bottles par years, and they distribute to over twenty countries around the world. The Fontevraud Abbey is particularly striking by its originality and its size. This Abbey is a Benedictine style abbey founded in 1101. It is one of the biggest monastic places in Europe with its 13 hectare. Its history is complex and interesting: it has been converted into a prison by Napoleon in 1804, saved from destruction… Its history began with the formation of an unusual collection of monks, nuns and lay brothers who chose the location to form a community to care for the sick as well as worship. Its founder Robert d' Arbrissel decreed that the order should be governed by an abbess and it stayed that way right up to the revolution. This holy alliance was given greater credence when its abbesses were appointed from noble families (voluntarily or otherwise) who gave the order great patronage and protection. The most famous of these being the Plantagenets and it is here they chose to be buried -- you will find the effigies of Henry II king of England and count of Anjou, his wife Eleanor of Aquitaine along with their son King Richard the Lionheart in the naive of the pristine abbey church. The beautifully restored abbey complex includes a Romanesque abbey church with royal tombs, a lovely Renaissance cloister and a fascinating Byzantine-Romanesque kitchen. Listed as World Heritage Site by Unesco, Fontevraud Abbey is now a museum, a cultural center and it also houses a hotel and a restaurant. The Mabileau family worked in the vines since 1620. Over 300 years later, inspired by his father Jean-Paul Mabileau, Frédéric Mabileau also discovers the pleasures of cultivating grapes and making wine. The beginning of his wine adventure was in 1988 when Frédéric Mabileau planted his first vines of cabernet franc. Conscious of the rich diversity of soil that his vineyard had to offer, Frédéric Mabileau started a long study of all the different terroirs in order to create his own individual line of wines. The "Graviers" cuvee, at the origin of Jean-Paul’s domain was kept. Then, "Coutures" made from the oldest vines of the vineyard, and "Racines", a small parcel planted by Armand his grandfather, was decided to be exclusively produced on clays and limestone from "Clos Lorioux". Today, in their garden of 28 hectares (70 acres), Frederic and his team give their best to produce soulful wines. With the combination of tradition and modernity, they offer multi-faceted wines from the Saint Nicolas de Bourgueil, Bourgueil, Saumur and Anjou appellations… the fruit of rigorous efforts, vinified in full respect of each grape. Your driver will pick you up this morning and bring you home in the evening. You will climb aboard a traditional flat-bottomed wooden Loire river cruise boat fitted out in elegance and comfort. The trip will take you on the Loire river and you will discover its flora and fauna. This region is named as the “Garden of France” thanks to the fertile land along the Loire. Please note that the final itinerary will depend on the height of the Loire River – and the presence of possible sandbanks. A stroll through Chinon is a journey back in time … From facades to small places, from dead ends to interior courts; you will discover the secrets of the city of Richard the Lion heart, Joan of Arc and François Rabelais. You will first be caught by the Royal Fortress ; located at the crossroads of the three provinces of Anjou, Poitou and Touraine, the rocky spur where the Royal Fortress of Chinon stands is a strategic area occupied and highly sought-after since ancient times. A castle was built here no later than the 10th century. It was Henry II Plantagenêt, Count of Anjou and King of England, who gave the fortress its current appearance by building a new palace on Fort Saint Georges. It was within the walls of the Château of Chinon that Joan of Arc finally met her king, Charles VII, in 1429. But ancient as the Royal Fortress of Chinon may be, it has something of a new feel at the moment after an ambitious 6-year restoration project and with the addition of the latest in museum display technologies. This semi-troglodytic Romanic chapel surrounds the grave of a hermit of the Early Middle Age known as Jean Le Reclus also called Saint John of Chinon. Inside, you will discover a sublime mural painting from the end of the 12th century. The tradition says that these paintings were made to be seen by candlelight. The Château de Villandry, built close to the Loire river during the Renaissance, is one of the more extravagant estates of this region. Villandry is considered to be home to the most beautiful gardens in the Loire Valley. The flowerbeds are never-ending, the fountains are abundant, and there are even white swans that can be found in one of the larger fountains. The various gardens, ten in all, witness the art of nature dompting: "les jardins à la Française" - the french gardens. The maintenance is done in an educated way in order to avoid using chemicals. The castle, listed as an Unesco World Heritage, demonstrates the art of living of that era: comfortable, welcoming and bright. From Villandry, stroll in a horse-drawn carriage in the Loire countryside. This will be an intimate opportunity to approach Mother Nature on another angle. Your driver will pick you up this morning and bring you to the train station for your departure to the south of France. See the French countryside as you travel by train to the Provence region of France! You will have First class train tickets, providing you with spacious seats, a dining car and business lounge access. You will also have one meal per person provided during your travels to the south of France. This train ride will be an all day event (roughly 8 hours), traveling first to Paris, transferring to another train and then the direct route to Cannes. Provence is a blanket term for the southeastern part of France that sprawls along the Mediterranean coastline and up into the rolling, vineyard-lined hills beyond. The best way to take in the region is by car (or in your case, motorcycle)! Upon arrival, you will make your way via taxi (at your own expense) to your hotel to check in. The rest of your evening is open to explore your surroundings! Walk around the town or choose to pick up your motorcycle and explore more of the coastline! Cannes has been synonymous with cinema for the past 70 years, so slip on your chicest set of heels and take a walk just like the stars along the infamous Boulevard de la Croisette, which separates boutiques like Chanel from the beach. If you want to get a sense of where the city started over 400 years ago, take a stroll through the streets lining the hill of Le Suquet, the Old Town. From the Old Port below, hop a ferry to the Lérins Islands, where you’ll find untouched sandy shores and wine crafted by Cistercian monks, the islands’ only residents. Île Sainte-Marguerite is the largest and closest island to mainland Cannes and home to historical sites like the cell of the Man in the Iron Mask as well as haute seaside eatery, La Guérite. Back in town, dine in a villa at L’Antidote, whose menu weaves market-fresh ingredients into rich dishes like foie gras-stuffed ravioli. If you want to sample a Provence specialty, try Chef Christophe Ferré’s version of bouillabaisse seafood stew. You may want to consider a day trip to Mont-Ventoux! 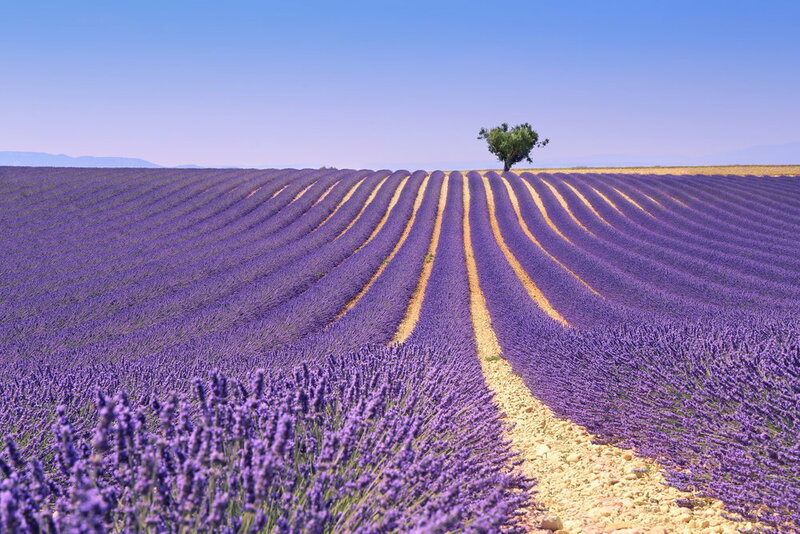 The fragrant lavender fields bloom from June to August in the Luberon, around the Mont-Ventoux, in the region of Sault and that of Valréas; such amazing scenery and atmosphere make the lavender fields one of the summer Must-Sees in Provence. This blue gold has been used for a long time to make soap and cosmetics; it is also part of the Provençal cuisine and lavender honey and lavender sorbets are worth a taste! Mont-Ventoux, with its majestic silhouette, dominates the landscape and is classified as a UNESCO Biosphere reserve. From the route there are exceptional views of the Alps in the North and the Mediterranean in the South. It passes through vineyards, orchards, and fields of lavender, the ideal landscape for a break in the great outdoors. Mont Ventoux is also a land of flavors with the truffles, the cherries of Mont de Venasque and the strawberries from Carpentras. While often seen as a stopover town, Nice is the Riviera’s main point of entry for good reason. One glance at the Cours Saleya flower market and you’ll quickly fall in love with the city. Tourist trap-style restaurants line the square, but if you head one street back, you’ll find the husband-and-wife-run Papayou, which serves a mix of Mediterranean and Asian-influenced plates (think Thai curry and fish stew). Nearby, La Petite Maison (whose empire spans from Dubai to Miami Beach) is a celeb fave, but for something just as charming yet slightly less flashy, walk across the street to owner Nicole’s newer bistro, Le Comptoir 2 Nicole. Start the your evening here with a cheese plate and rosé, or take your apéritif above water at La Réserve, a restaurant perched on a rock jutting over the harbor. If you want something that truly captures the Riviera’s party spirit, drive 10 minutes to neighboring Villefranche-sur-Mer for Le Palm Anjuna, the restaurant version of lively beach bar Anjuna Bay nestled along a hidden bay in Eze. Here, musicians serenade guests in a bohemian enclave of tropical plants, Balinese statues, and reclaimed wood tables. Then, *remember to bring your passport with you! * drive to Monaco! While not technically part of France, Monaco is still one of the major highlights to hit while touring the south. Just a 10-minute drive from the Italian border town of Ventimiglia, the petite principality of Monaco—it measures roughly three times the size of the National Mall in Washington D.C.—offers plenty of pursuits that can be as decadent or demure as you’d like. Lounge by the sea in Cap d’Ail at beach bar Eden Plage Mala, or treat yourself to a day of pampering at the iconic Thermes Marins Monte-Carlo, whose alfresco Jacuzzis overlook the port and Prince’s Palace. Before hitting the town, pause for a cocktail at the property's iconic Bar Américain or take your pre-dinner drinks down to the water at Wine Palace, whose plush couches sit along the port. Saint-Tropez swells in the summer months as yachts creep into port, but a quick stroll through the narrow, cobbled streets of Old Town reveals what attracted celebrities to this former fishing village in the first place. Start your morning at La Tarte Tropézienne with an espresso and a slice of the patisserie’s namesake cream-filled brioche (a Brigitte Bardot favorite when she was shooting the 1950s film "And God Created Woman"), then take your petit-déjeuner across the square to the Place des Lices and stroll through the stands of cheese and flowers at the open-air Provencal market, held every Tuesday and Saturday morning. After gathering a basket-full of picnic fixings, head over to the 15th-century stone Portalet Tower and work off those breakfast calories during a coastal hike along the peninsula’s best beaches—accessed otherwise only by boat. Le Club 55 and Miami Beach transplant Nikki Beach, whose anything-goes spirit and lavish costume parties are known to draw celebrities. For something more low-key, trek down to the tucked-away cove of L’Escalet Beach, where you can spread out on a shore sans tourists. Back in town, pause on the port at Sénéquier for a coffee and prime people watching until dinner at the buzzy, Asian-inspired BanH-Hoï, a Saint-Tropez institution in Old Town. Night owls can dance the evening away at the legendary nightclub Les Caves du Roy in Hôtel Byblos! Return your motorcycle in the early morning, or the night before. 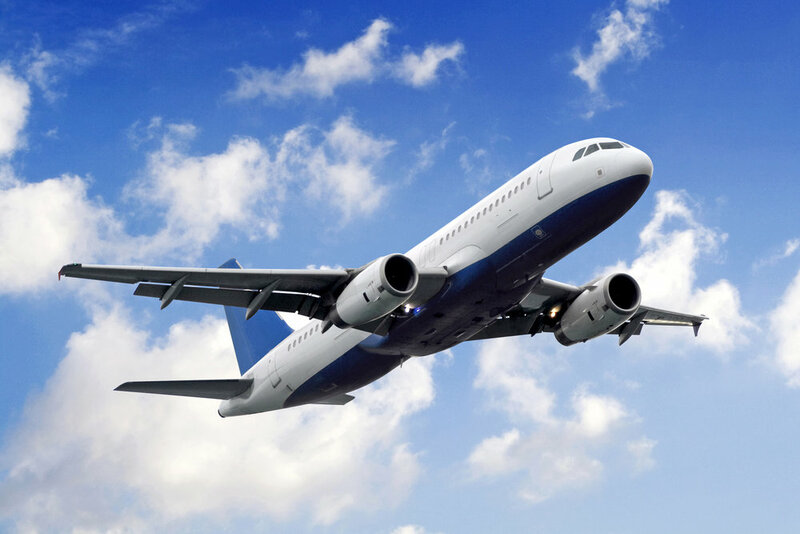 Today, you'll travel to Nice and board your plane for home. What are the menus to choose from for the Moulin Rouge dinner? These are the provided menus; however, these menus can and do change frequently.